Flawless iolites (0.5 carat) faceted from Palmer Canyon rough. Giant iolite gemstones & potentially the largest colored gemstone deposit in the world were discovered in the Laramie Range of Wyoming in between 1996 and 2005. Gemstones weighing >24,000 carats were recovered with large masses remaining in outcrop that were estimated to include stones >100,000 carats - some possibly much larger! And this was only at the surface - who knows what lies a few inches or feet underground. Another was found nearby but remains unexplored. But past exploration suggests it could contain > a trillion carats of water sapphire (iolite) gemstones based on surface sampling, trenching & mapping around the second world war. How could these deposits have been overlooked for so long? It goes to show that giant mineral deposits are sitting out there, right under our noses and few if any people are looking. And these are not rare discoveries. Discoveries like this happen all of the time and supports that we have barely touched the surface when it comes to mineral resources. found and faceted in Wyoming. One of the more exciting gemstone discoveries made in recent history of gemstones was gem-quality iolite in Palmer Canyon west of Wheatland, Wyoming. This led to a discovery of a world-class gemstone deposit at Grizzly Creek and a second probably world-class deposit at Ragged Top Mountain (which could be the largest in the world). This latter deposit could lead to its classification as one of the largest gemstone deposits ever found; however considerable field and laboratory investigations are necessary (Hausel, 2005b). 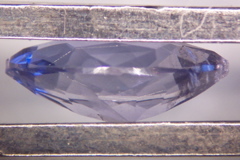 Gemologists refer to gem cordierite [(Mg,Fe3+)2Al4Si5O18] as iolite. Geologists and mineralogists refer to it as cordierite. Cordierite typically is found in the vicinity of other alumino-silicates such as andalusite, kyanite and sillimanite. Host rocks include alumina-rich mica schists (metapelites) that have been subjected to amphibolite-facies metamorphism. Cordierite is also found as a replacement mineral in alumina-rich syenite-anorthosite complexes and in some shales. It forms short prismatic crystals with rectangular cross sections as well as granular masses and nodules of various shades of blue, bluish-violet, gray and/or brown. Fresh cordierite has a hardness of 7 and specific gravity of 2.55 to 2.75. The hardness is favorable for durable gemstones. The principal deposits that supply much of the world’s market are Sri Lankan placers in spite of low specific gravity. Iolite exhibits strong pleochroism that varies from light gray, dark violet-blue, to light sapphire blue. The gem may appear deepest blue when viewed down the c-axis and light blue to light grey in other orientations. These color variations are one of the attractive features of this gem. Iolite is often enclosed by a reaction rim of pinite (Hausel, 2002). The luster of iolite is vitreous and when polished, it becomes increasingly lustrous. Gems >12 carats are unheard of, even so, rough material collected at Palmer Canyon and Grizzly Creek represents many of the largest iolite gemstones in the world. In Wyoming, cordierite has been found in gneiss with quartz and biotite as porphyroblasts with xenoblastic texture (Hausel, personal field notes, 1995). The geology of Wyoming near greenstone and supracrustal terrains is favorable for these and other aluminous gemstones. 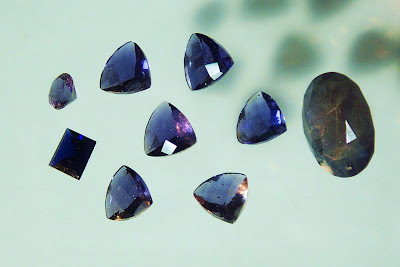 Iolite is reported in Canada, India, Myanmar, Sri Lanka, India, Brazil, Tanzania, Finland, Germany, Norway and the United States. The highest quality gems are found as pebbles in Sri Lanka and as porphyroblasts in gneiss in Wyoming. Large nodular masses of iolite were discovered in two separate deposits in Archean gneiss in Wyoming, and a giant disseminated deposit may occur in the Laramie Range anorthosite-syenite batholith (Hausel 2002; 2004; 2006a). These deposits represent the largest in the world, but remain poorly explored (Hausel, 2005b). Two deposits (Palmer Canyon and Grizzly Creek) are poly-gem occurrences with ruby and sapphire as accessory minerals along with considerable kyanite in schist, glimmerite (vermiculite) and gneiss. The metapelites represent enclaves of aluminous schist and gneiss. A third deposit in the vicinity of Ragged Top Mountain is hosted by 1.5 billion year old anorthositic-syenitic rocks. This latter deposit remains unexplored even though minor granular gem-quality iolite was verified by Hausel (2006a). Local enrichment of iolite at Palmer Canyon and Grizzly Creek is promising. It is not uncommon to find gems of several hundred carats in both deposits with occasional masses weighing thousands of carats! Flawless iolite of more than a carat, viewed from side held by tweezers. 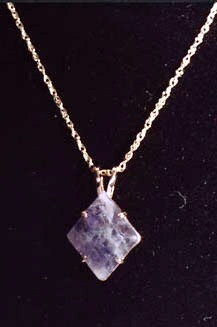 Palmer Canyon Iolite was discovered in 1995 at Palmer Canyon during field reconnaissance (Hausel, 2002). The deposit lies along the eastern flank of the central Laramie Range 16 miles west of Wheatland within Archean quartzofeldspathic gneiss, granite gneiss, pelitic schist, and biotite-chlorite-vermiculite schist north of the Elmer’s Rock greenstone belt. A shallow prospect pit was dug in vermiculite prior to 1944. Only a small amount of vermiculite was found. The vermiculite contains chlorite, kyanite and corundum. Samples of vermiculite-chlorite-biotite-corundum schist collected from a small prospect pit contained as much as 10-20% corundum. A minor amount of corundum is gem quality. 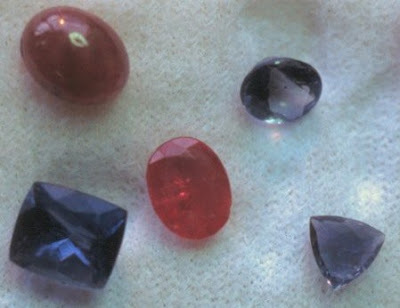 Several specimens produced high-quality ruby and pink sapphire. Cordierite was discovered in nearby quartzofeldspathic gneiss. Samples of cordierite gneiss yielded transparent cordierite grains including several weighing >100 carats. Some gneiss collected from the property contained as much as 20% transparent cordierite. The cordierite occurs as rounded to disseminated grains and large nodules. Foliation in the host rock parallels the margin of nodules and in some samples appears to terminate against the nodule boundary, suggesting that some of the cordierite formed during a post regional metamorphic event. Nearby, kyanite schist contains 20 to 50% excellent, light to sky blue with lesser tawny, green and red gem-quality kyanite prisms. Transparent blue iolite occurs as large porphyroblasts, nodules and disseminated grains in gneiss adjacent to corundum and kyanite schist. The iolite was traced over a strike length of 500 ft and continues under soil for an unknown distance. A handful of large nodules were found at the time of discovery that include a raw, high-quality transparent gem known as the ‘Palmer Canyon Blue Star’ of 342.8 grams (1,714 carats), which was the largest iolite gemstone in the world at time of discovery. In addition to clear, transparent, violet blue gem-quality cordierite, some black translucent cordierite (‘Palmer Canyon Black’) was recovered. The Palmer Canyon Black produces attractive cabochons. Much of the high quality rough material ranges from pleasing violet to a very light-blue color with only a hint of cleavage and parting. Microscopic examination shows few mineral inclusions in some gems. Gray to dark gray cordierite has well-developed parting and cleavage. A group of cabochons weighed 0.27 to 3.02 carats. These are dark-gray to black, translucent to opaque, near gems with distinct cleavage, parting and some fractures. necklace (photo courtesy of Chuck Mabarak). Grizzly Creek Grizzly Creek is accessed from the Palmer Canyon road about 4 miles east of the Palmer Canyon deposit at the base of the Laramie Range. Following discovery of Palmer Canyon iolite, similar deposits were predicted to exist in Grizzly Creek (Hausel and Sutherland, 2000). The thermal metamorphic event responsible for the large cordierite porphyroblasts at Palmer Canyon appears to have been widespread in the central portion of the Laramie Range. The earlier prograde metamorphic event produced large prophyroblasts of kyanite in the adjacent rocks. It became clear during the initial field investigation that a major gem deposit had been discovered. Very large masses of gem-quality iolite were found, as well as large quantities of gem-grade kyanite. Cordierite at Grizzly Creek is surrounded by kyanite and sillimanite schists that contain minor corundum. The kyanite and sillimanite schist lies in a 300 by 5000 foot belt of metapelite. Much kyanite appears to be cabochon grade and has a very pleasing, sky-blue color, with some tawny and pink specimens. Iolite found nearby is massive and forms large replacements of the schist. This one deposit may represent the largest iolite occurrence in the world. During reconnaissance, specimens of massive iolite were collected including one football-size transparent gemstone that weighed 24,150 carats – the largest iolite gem found in the world that now resides in the Wyoming Geological Survey museum. However, this stone is dwarfed by masses of material that remain in place in Grizzly Creek. Some of the massive gem material will require quarrying operations to recover. It is very likely gem specimens >1 ton (>4.5 million carats) could be recovered (see photo above)! Grizzly Creek Blue Giant (left) weighing in at 24,150 carats and fresh broken surface at Grizzly Creek showing gem iolite. The first report of iolite in Wyoming was by the renown mineralogist John Sinkankas (1959). A brief description indicated that iolite was a widespread constituent of schist and gneiss. In describing this particular deposit Sinkankas wrote, “…one estimate has placed the quantity available at thousands of tons. Specimens at this locality examined by the author are glassy broken fragments of rather light blue color, verging towards grayish, small sections are clear and suitable for faceted gems. It is entirely possible that important amounts of gem quality material will be produced from this locality in the future.” Unfortunately, Sinkankas did not give a location: the whereabouts of this giant deposit remains unknown? After I had discovered the Palmer Canyon deposit, I came across this reference and called Sinkankas to get more information. However, he was unable to remember anything about the deposit - but it likely was the Ragged Top - Sherman Mountains cordierite deposit. At the time of Sinkansas's writing (1959), only one cordierite deposit had been described in the literature in Wyoming. The deposit, known as the Sherman Mountains deposit, occurs 15 miles south of Palmer Canyon. This deposit is in Proterozoic (1.4 billion year old) metanorite, syenite and syenite-diorite gneiss of the Laramie anorthosite complex intrude the Cheyenne suture (1.8-1.6 billion years old) zone. Widespread lenticular to tabular layers of cordierite is found in metanorite (hypersthene gneiss), gneiss and syenite along the southern margin of the anorthosite complex (1.5 billion years old). The deposit was described by Newhouse and Hagner in 1949 (see Hausel and Sutherland, 2000) for its potential to produce magnesium from cordierite. There was no mention of gemstones during this investigation, but this is likely the deposit mentioned in passing by Sinkankas in 1959 as it was the only known cordierite deposit known in Wyoming at the time. The host rock was described by Newhouse and Hagner to have as much as 50 to 80% cordierite. The occurrence lies 0.5-mile west of Ragged Top Mountain in a belt 0.3 to 1.2 miles (0.5-1.9 km) wide and 6 miles (9.6 km) long. The host gneiss is highly foliated, intensely folded and contorted. The weathered cordierite was described to have dark brown surfaces that yield to blue or bluish gray massive material on fresh surfaces: sounds like iolite. I (Hausel) was able to collect small samples of disseminated cordierite along the margin of this deposit in a road cut. All of the cordierite I collected along the edge was very high quality and flawless gem material. The material ranged from 1 to 4 carats in weight! The rest of the deposit, including the portions described as massive remain unevaluated for gemstones and this deposit may represent the largest, colored gem deposit in the world. During the second world war, two geologists - Newhouse and Hagner investigated this deposit and published a report in 1949. They investigated the deposit of cordierite for its magnesium content and ignored the gemstone potential. The deposit was mapped and trenched and a surface resource was estimated. The deposit was investigated and described to be scattered over a few square miles in lenticular to tabular masses in low ridges in the host rock known as metanorite. This occurred over an area of 5 miles long and 0.25 to 1 mile wide. Some exposures are described to have 60 to 80% cordierite. It was estimated at the time that the combined deposits with strike lengths of 100 feet or more, contained >453,600 tonnes of cordierite! This was only based on surface samples and trenches and no drilling was conducted to determine the depth of this deposit. One tonne contains 5 million carats, and 453,600 tonnes contain 2,268,000,000,000 carats! If we assume that only 10% of this deposit is gem-quality, there would still have an incredible amount of gem material (and this does not include the potential resource below the surface. Just imagine how much in the way of gemstones likely occur within the first hundred feet of the surface. Sinkankas (personal communication, 2002) indicated that much of the material was gem-quality (Sinkankas, 1959, 1964). This (along with Grizzly Creek) could be one of the greatest discoveries of colored gemstones in history. BUT, investigations were ended in 2006 as my field vehicle was confiscated and given to the WGS secretary, I was no longer allowed to present talks to the public and professional groups, and much more. Why the cover-up? 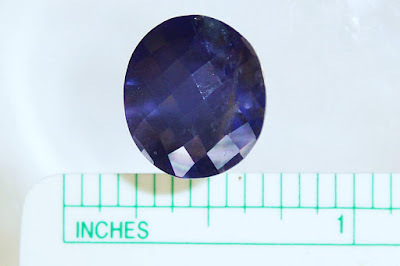 6-carat iolite cut from Grizzly Creek cordierite. This and the other iolite-ruby-sapphire-kyanite deposits discovered in the central Laramie Range needed to be completely evaluated by geological mapping, sampling, faceting of material and drilling. Instead, all research related to these giant discoveries and the work on the giant opal deposit near Riverton, were terminated due to politics. Owen CreekAnother iolite deposit in the northern Laramie Mountains is referred to as Owen Creek (Hausel, 2009). This contains kyanite, sillimanite, cordierite and relict staurolite in pelitic schist in this region and remains unexplored. Cordierite is also reported at South Pass (Hausel, 1991), Copper Mountain (Hausel and others, 1985), in the Sierra Madre, and in the Powder River Basin. The cordierite occurrences at South Pass were investigated by me during field mapping of the greenstone belt. I did not observe any gem-quality material in that area. However, I highly recommend investigations of cordierite at Copper Mountain as this supracrustal belt contains abundant metapelite (alumina-rich rock) that was subjected to similar metamorphic conditions as the Elmer’s Rock greenstone belt. For more information, see Hausel (2009a, 2009b, 2009c). See our website at: Gemstone Hunter. Follow us on Facebook and Gem Hunter and learn more about gemstones and gold. Choices we make when purchasing products for our personal use are greatly influenced by what we see on TV or read in newspapers and the last year had a lot to show us. Here are some of the most striking Designer Jewellery trends that we think will carry over last year. Check them out! 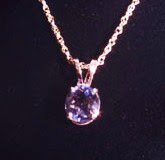 Nice blog, click the links buy original gems an affortable prices. thanks for sharing this information with us.this post is very helpful. AgateExport Gemstones have assumed different parts in the myths and legends of human societies all through history. Some recount a story or are accepted to have extraordinary forces, however every one of them share a typical wonder. Every gemstone is one of a kind with a unique shading, origin and story. Gemstones come in each shade of the rainbow and are accumulated from all sides of the world.